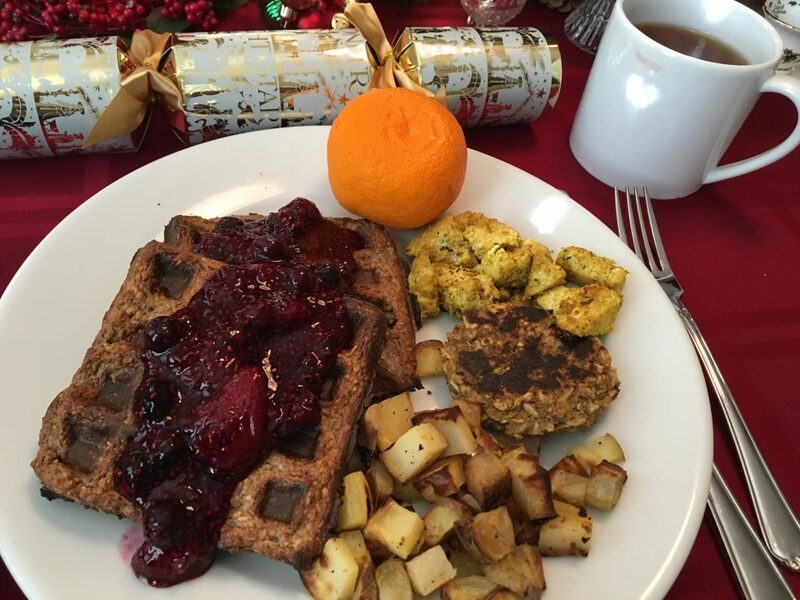 Oat Waffles, chia berry jam, air fried potatoes, mandarins and oat breakfast sausages. 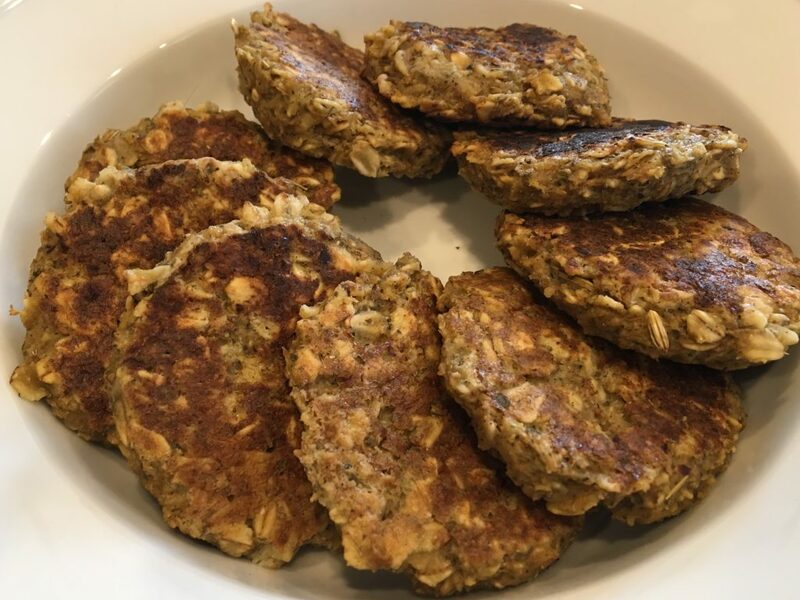 For the Oat Waffles I like to use the gluten free, oil free All Oat Waffles recipe from The How To Prevent and Reverse Heart Disease cookbook as my template. I provided a link to the waffle recipe because I don’t have permission to share the recipe. You can vary the taste by what you add to it. The bananas, oats and flax or chia seeds are tossed into a blender to break them up a bit so you have a smoother batter to work with. Don’t over process it you want the oats to stay somewhat intact and not be ground up fine like a flour. I like my waffles made with vanilla powder, cinnamon and freshly grated nutmeg. You can use orange or lemon zest, add blueberries to the batter, use a little canned pumpkin or mango in place of some of the banana, add a few raisins and so on. 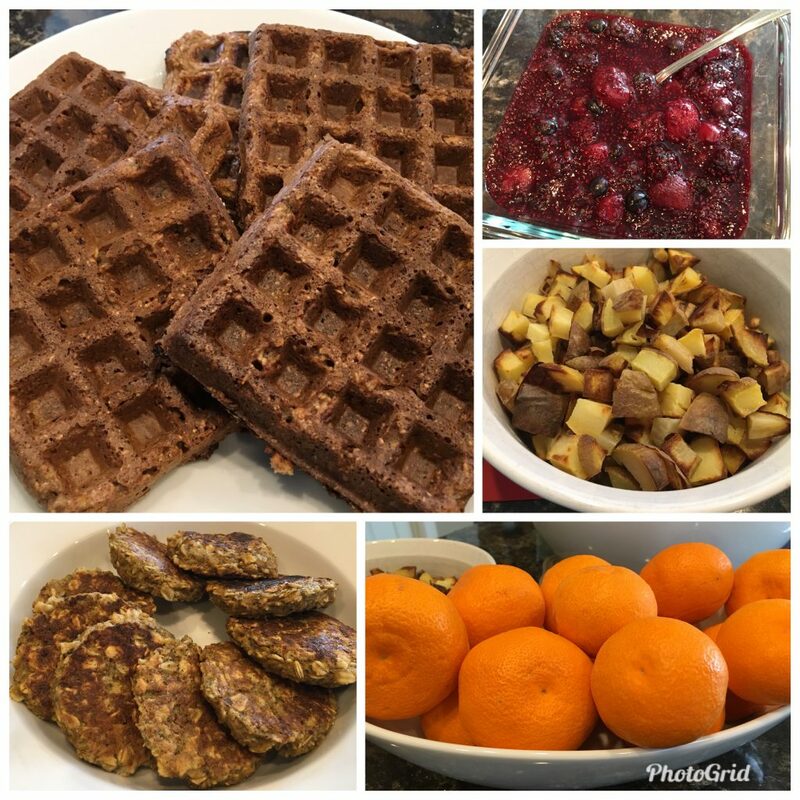 My friend Christin has a blog Beans Not Bambi where she shares whole food plant based recipes and she has a Pumpkin Oat Waffle recipe you might also enjoy. Lots of possibilities for variety and different flavor profiles for these gluten free waffles. The trick to doing no oil waffles is to use a non stick waffle maker, preheat it and get it nice and hot before pouring the batter onto the waffles plates. Secondly you must leave the waffles in until they are completely cooked or they will stick and tear when you try to remove them. How long that takes is going to vary depending on your waffle maker. You will have to experiment and see what works best with your appliance. 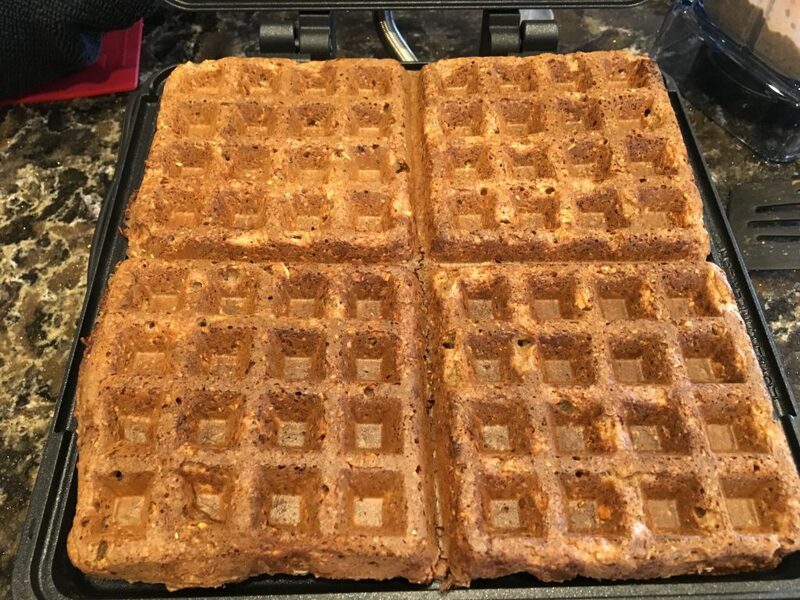 In the picture above I opened the waffle maker to check on them and although they were brown they were not quite crispy yet so I shut the lid and let them cook longer. Then I placed them on a wire rack to cool so the steam could escape. Once they are room temp you can freeze or refrigerate them. Reheat in the toaster oven. I have the Cuisinart Belgian Waffle Maker and I love it. My daughter had it first and highly recommended it. I have been very happy with it for waffles and potato waffles. I like to batch cook the Oat waffles ahead and freeze them. They can be reheated in the toaster oven to retain the crispness that a waffle should have. Vanilla Bean Powder, cinnamon and freshly grated nutmeg add a hint of sweetness to the batter without adding any sugar or calories. I use Terrasoul Vanilla Bean Powder all the time now in recipes. It is ground vanilla beans – that’s it – no additives, no alcohol, no added sugar. If a recipe calls for a teaspoon of vanilla extract I use a 1/4 teaspoon of the vanilla bean powder. A little goes a long way! 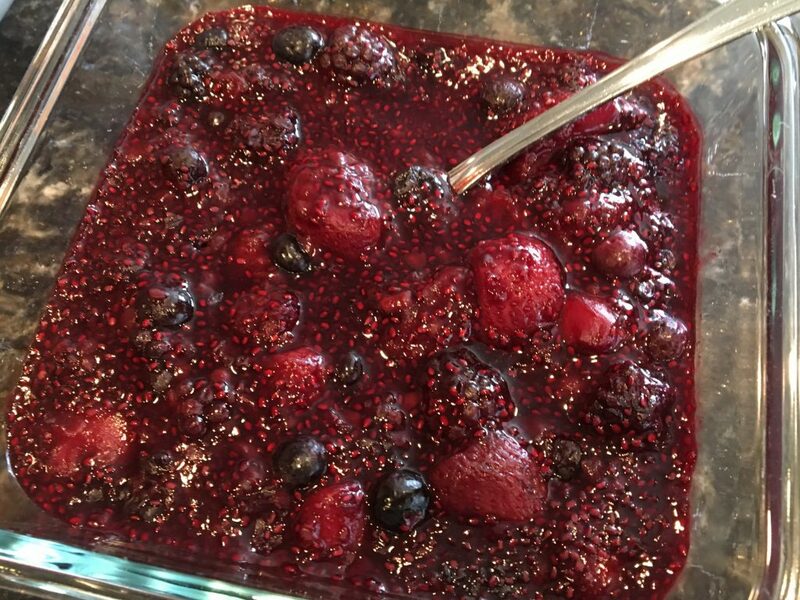 I made this Chia Berry Jam to put over my waffles since I don’t eat Maple Syrup – (it’s too sweet and too high of a calorie density) and the funny thing is everyone else liked it on their waffles too! My daughter made regular whole wheat waffles for everyone – I made my own banana oat waffles because I follow a gluten free diet. Waffles with chia berry jam can also be served as a dessert! The chia jam is lovely on a muffin, banana ice cream or over a baked sweet potato. Yummy! You can also make my favorite oil free healthy Quinoa Banana Oat Muffins – they are delicious! It is so easy to make hash brown potatoes in the Breville Air Fryer or whatever brand of air fryer you have. 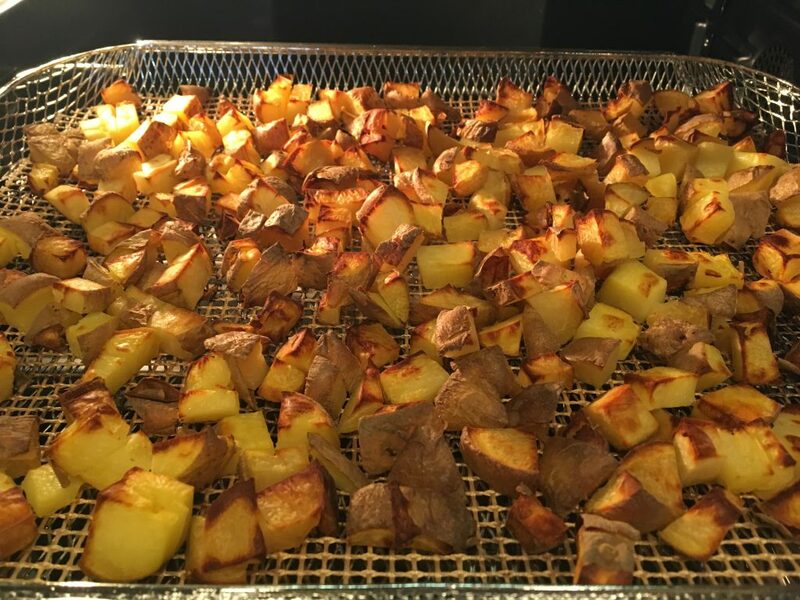 I used pre-cooked potatoes – some Yukon gold and some russets that I had chilled in the fridge. Simply cube them and place on your fryer tray and fry in a 400 degree preheated air fryer for 20-30 minutes – until golden brown and crispy. I don’t even season them as I think they are tasty on their own but you could use some no salt seasoning if you like. I forgot to photograph the Tofu Scramble that daughter Katy made but you can see a spoonful of it on the plate in the above photo. We love the recipe from Isa Chandra, just skip the oil and salt. Everyone will eat this brunch item. I don’t very often eat tofu but once in a while I will have some. A spoonful of it was all I needed. What would brunch be like without a little breakfast sausage? This recipe was posted by Kerry Blumenthal on the private facebook page for Chef AJ’s Ultimate Weight Loss program. She gave me permission to share it here with you. Let me tell you that this recipe is amazing! Seriously it tastes like sausage and it has a great texture to it as well. They freeze well and are good for travel or for hiking and bike riding. I have tweaked the recipe a little bit to suit my taste buds and you can do the same. I eliminated the sweetener it called for because it doesn’t need it and added fennel and red pepper flakes because I like those flavors. The original recipe also called for quick cooking oats which I don’t buy so I use old fashioned oats and it works great. You are going to love these! The recipe called for baking these in the oven. I have never had success at baking any type of veggie burger. They always work best for me to cook them on the stove top in a non stick pan. I use a large Scan Pan Skillet and nothing sticks to it! They get nice and brown on the outside and stay moist on the inside. Put spices, nutritional yeast and ground flax in boiling water in a medium size sauce pan on the stove, stir, add oats and stir while cooking until it starts to come together and looks like a “hot mess.” This takes a couple of minutes because the oats need to cook. Once it comes together you can form the mixture into 12 patties. I like to use a plastic lid lined with plastic wrap to make perfectly shaped patties. You can see the technique here. Preheat a large non stick skillet over medium heat and brown the sausages on each side about 4- 5 minutes per side. It’s important to let them get brown before you try and flip them. If they aren’t cooked enough they will stick and tear apart. Set the timer for 4 minutes and don’t peek until the timer goes off. If not brown enough let them cook a little longer. After browning on both sides remove from pan. These can be refrigerated or frozen. Heat up in a skillet or microwave or the toaster oven. Great crumbled over a salad or a baked potato with a little marinara sauce for a pizza flavor. Crumble over some zucchini noodles with some marinara sauce. Lots of possibilities for creative munching! Check out my Amazon Product Recommendations page under the Shop tab at the top of the page. Wow this looks fantastic. Thanks Tami! I enjoyed your cooking stream with Heather. You mentioned a legume version of the sausage recipe that I hope you’ll share sometime. 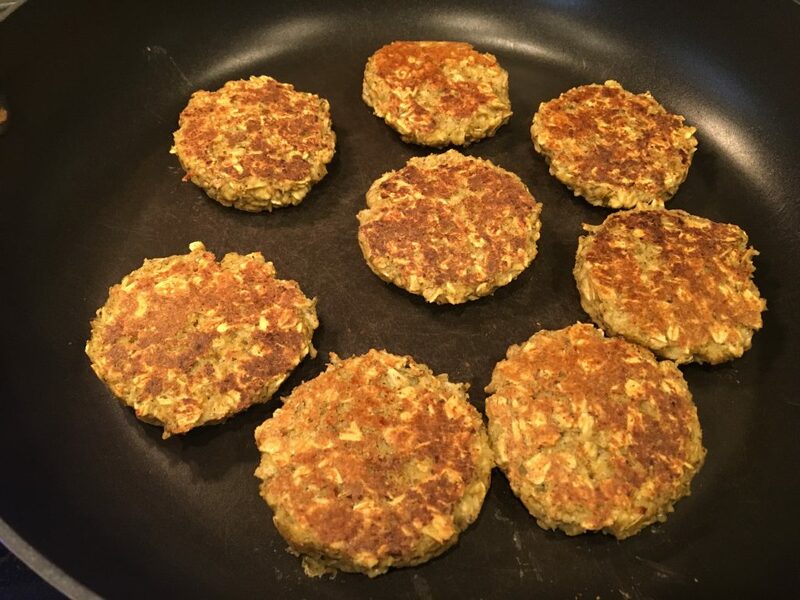 I’m on the hunt for more legume recipes, and breakfast sausage sounds like a great way to work more into my diet. Hi Susan, The bean version of sausages is in the new Engine 2 cookbook and they are called Epic Brats. I won’t be able to share that recipe but you might be able to check that cookbook out from your local library. Just wondering if you are having a cooking event in April? I could not find anything on Eventbrite. Thank you for all of your wisdom in the plant based world. We had to cancel our April event due to some unforseen circumstances – we might be able to have one in May but I don’t know yet. I will post about classes here on the blog and on the Nutmeg Notebook facebook page when we can resume classes again. Stay connected and we will be resuming classes as soon as we can!